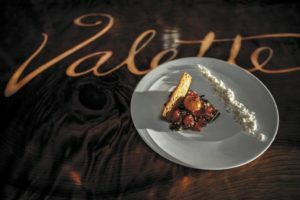 When Dustin Valette says he feels a spiritual connection to his new Valette restaurant in downtown Healdsburg, he’s not just talking feel-good fluff. It’s possible he sees a friendly ghost or two in the space that was formerly Zin Restaurant & Wine Bar. Second, there’s the long history with his good friends, Jeff and Susan Mall, who for the previous 15 years owned Zin. The Malls, who said they were unable to reach agreement with their business partner on the future of Zin, closed it last December and moved to Baja California. The building is now Valette’s treasure, with 130-year-old redwood plank tables and a busy open kitchen. There’s nothing nostalgic about the menu, however. 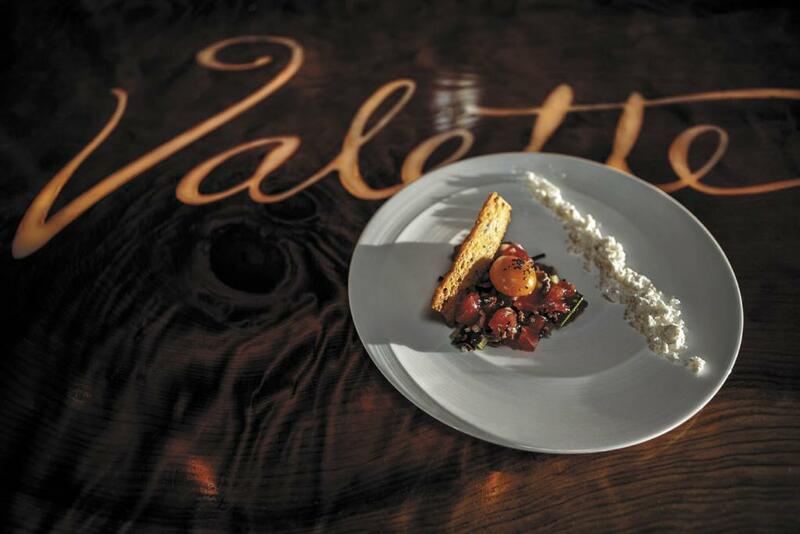 Valette spent the past six years as executive chef with Charlie Palmer at Dry Creek Kitchen, and yes, he offers the superb artisanal salumi for which he became famous there. Now, the charcuterie is finished in a box custom-made by Valette’s brother, Les Garzini. 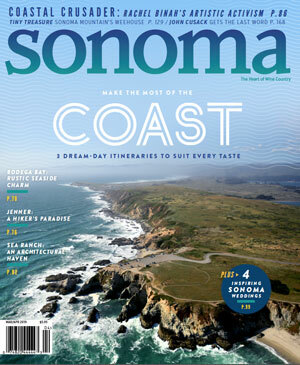 But the Healdsburg native puts his own imaginative twist on other recipes, brimming with eclectic accents while still showcasing the simple beauty of mostly local ingredients. Those are Bernier Farms vegetables in the celeriac soup dotted with toasted pistachio, beet tartare and a golden goat-cheese puff. Thin-shaved Early Bird Farm radishes gild the Hawaiian ahi niçoise with salted cucumber, 64-degree egg yolk and olive powder, and Liberty Ducks star in the cured smoked duck breast and thigh roulade with Pinot-poached foie gras. The dressing on the black quinoa dumplings is extra-special, made with charred scallions. “They come from Valette Estate,” the chef quipped. Another signature is the sourdough flatbread, baked on-site. Great-grandfather Valette would be so proud.